I watched as my three-year-old son, Nathan, stepped onto the bathroom scale and waited patiently for the digital number to appear. When it did, he sighed and shook his head. “I weigh frirty-free pounds, Mommy,” he said as he stepped off the scale. 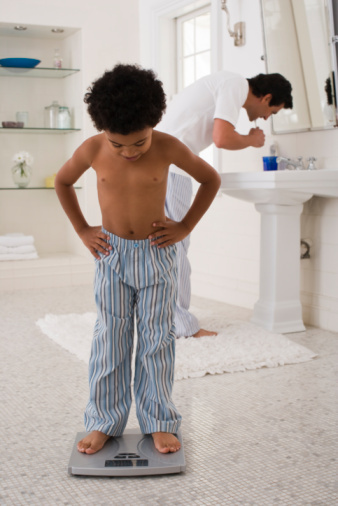 I suppressed a smile, knowing that my little boy was merely imitating what he saw me do every morning. That evening at dinner, my husband, Eric, asked each of our children what they had learned that day. One child mentioned that she got an A on her science test. Another said that he learned a trick to remember how to multiply by nines. Right or wrong, Nathan was watching me. Right or wrong, he was imitating my behavior. And it seemed that I was doing a whole lot more wrong than right. “But I color in it, just like you, Mommy,” he said again. “But I just want to be like you, Mommy,” he said, sticking out his lower lip. I sighed and glanced down at my badly damaged Bible. Despite the green marker mess, one of my favorite verses jumped off the page at me. It says, “Train children in the right way, and when old, they will not stray” (Prov 22:6). “Thanks for the reminder, Lord,” I murmured, as I found Nathan’s children’s Bible and began to read to him. I’m far from a perfect mother. My three-year-old son has a potty mouth and a slight obsession with his weight. Both of those things can be blamed on me. But he is also starting to understand the importance of studying God’s Word. Maybe I’m doing something right after all. Diane Stark writes from Indiana.